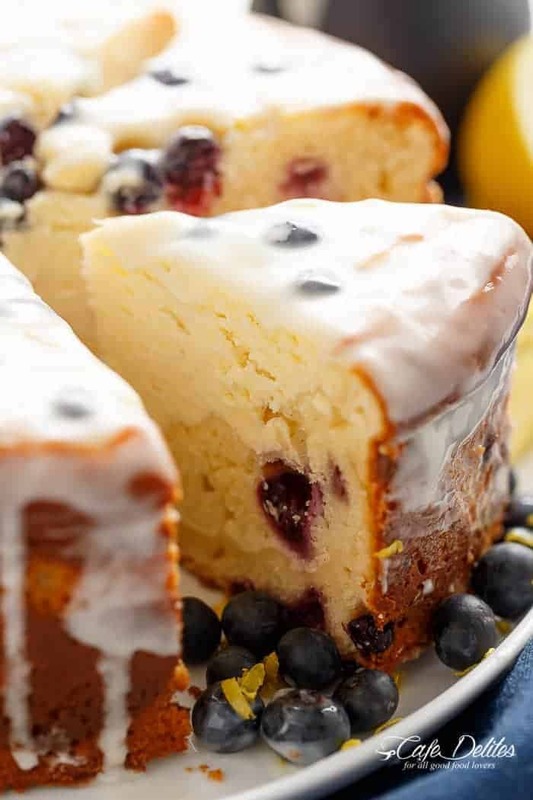 Blueberry Lemon Cheesecake Cake with a Lemon Cream Cheese Glaze to kick start your season! The perfect Spring-time dessert. 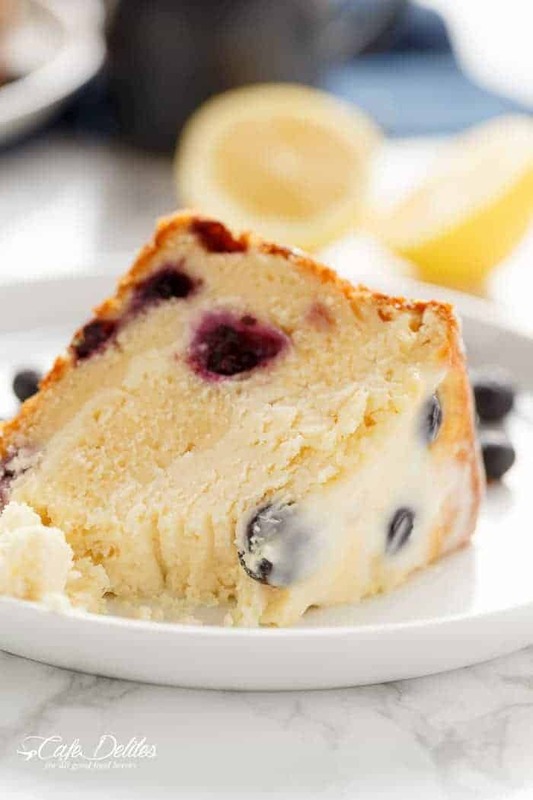 Blueberry Lemon Cheesecake Cake is a blueberry cake scented with a zesty lemon aroma underneath a creamy and fluffy cheesecake, baked in the one pan! The first of it’s kind! After making, devouring, and crying over the last slice of Carrot Cake Cheesecake, it was time to take that recipe and turn it into a completely new and different cake. I wanted blueberry and lemon together, and searched through every internet page and recipe book I could find. THIS CAKE is not in any book, not on any blog or website or in any restaurant, cafe or diner. I’m proud to say it’s the first Blueberry Lemon Cheesecake Cake invented! This cake is deserving of a freaking drumroll. I baked it FOUR TIMES before nailing the recipe! Keep in mind, blueberries were priced at over $5 per punnet when I decided to experiment — and fail time and time again — before getting it right. Great thinking on my part. What I thought would be an easy transformation from carrot cake to blueberry cake turned out to be anything BUT easy. Gah this cake! The first time I baked it, and photographed it, it wasn’t right. The cheesecake was crumbly. The cake itself was dry. What the hell is going on? Taking my time and pouring love into the second attempt, I thought excitedly this was it. Nailed it. Only to smell something burning in my kitchen 20 minutes later. What had I done? I’d turned the broiler (grill) on instead of the oven. So I had a charred, black top, furiously smoking and about to catch on fire while the underneath was raw batter. My kitchen is now the proud owner of a fire extinguisher. Back I went in the THIRD TIME; accidentally confusing baking soda with baking powder. When removing it from the oven, all I saw was the wrongness of the texture and realised I’d also forgotten to add in the milk which was still sitting on my counter — with a straw magically appeared in it — and my son attached to the other end of it. Needles to say, I was ready to throw it all in after the sixth trip to the supermarket (forgetting the cream cheese in both extra trips), but my extreme stubbornness got the better of me and I tried ONE MORE TIME AT MIDNIGHT. Yes, at midnight. If that’s not stubborn dedication, then what is. And I’m so glad I finally did it, because this cake is absolutely prefect. Moist, fluffy, full of juicy blueberries, with the creamiest cheesecake sitting on top. Drizzled in a cream cheese glaze, it does NOT get any better than this cake! A round of applause, a bottle of wine later along with blood, sweat and tears, it’s finally here for you to enjoy. The moral of this story? I now have 3 blueberry lemon cheesecake cakes sitting in my refrigerator. Anyone want cake? 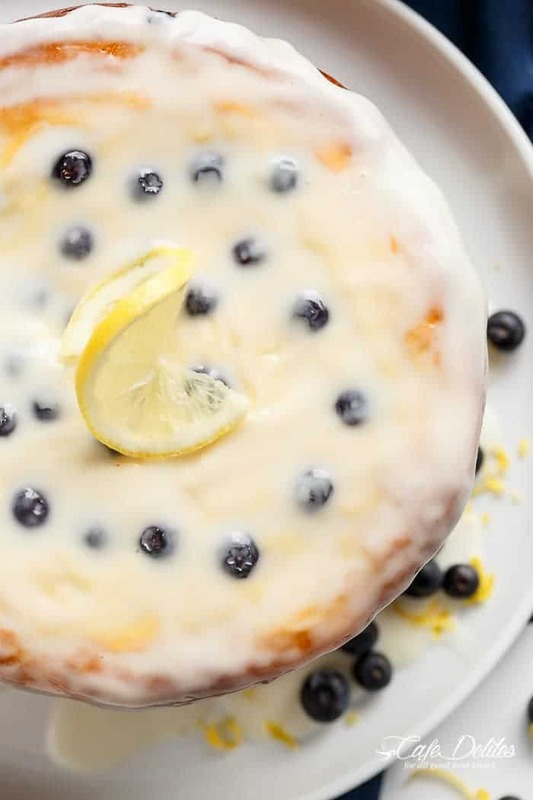 Blueberry Lemon Cheesecake Cake with a Lemon Cream Cheese Glaze to kick start your season! This cake makes for the perfect Spring-time dessert. 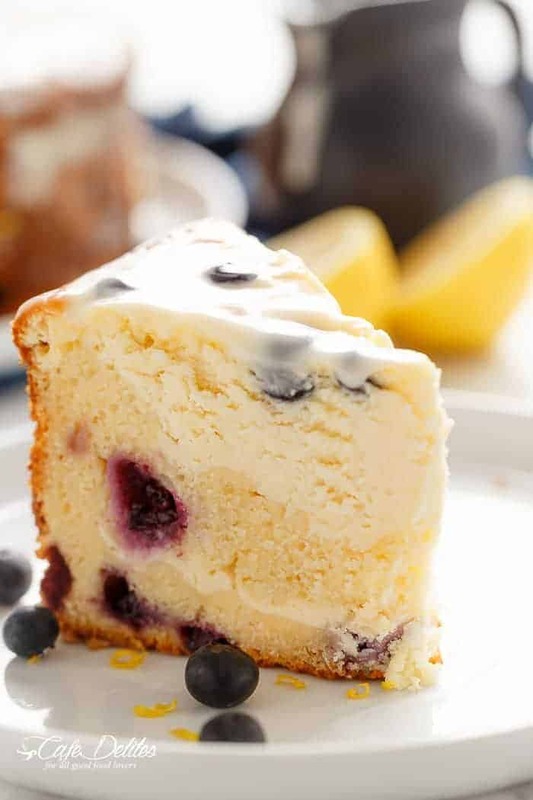 A blueberry cake scented with lemon underneath a creamy and fluffy cheesecake, baked in the one pan! Preheat oven to 175°C | 350°F. Lightly grease an 8-inch round springform pan with cooking oil spray and set aside. In a jug, whisk the lemon juice together with the milk; set aside and allow to sour (making your very own buttermilk). In a large bowl, beat together the butter and sugar until light and creamy. Beat in the eggs and zest until light and creamy. Beat in the 'buttermilk' (lemon juice/milk mixture). Add the flour, baking powder and salt, mixing them first on top of the wet ingredients, before folding them in to combine the batter. Gently mix 3/4 of the blueberries through. Beat the cheesecake ingredients together until smooth and lump free (about one minute on low speed). Evenly pour half of the cake batter into the prepared pan. Pour 1/3 of the cream cheese mixture over blueberry cake layer (don't swirl it through). Pour the remaining cake batter over the cream cheese; then pour the remaining cream cheese mixture over the top to evenly cover the cake. Sprinkle remaining blueberries over the top. Bake in preheated oven 65 - 70 minutes, until the centre is just set (it will have a very slight wobble to it). If you find it is browning after 30 minutes, tent with foil being careful the foil does not stick to the cheesecake). Remove from the oven and allow to cool for an hour or so. Cover with foil and refrigerate for 6 hours or over night. Beat all glaze ingredients together until smooth. Once cake has chilled, remove from pan onto a serving dish. Pour the glaze evenly over the top and allow to drizzle down the sides of the cake. Serve with extra blueberries. Delicious!! Took to school for Friday Treats and everyone LOVED it. Cooked for the full 75 minutes, came out perfectly. Made a simple lemon juice/powdered sugar glaze since I was out of cream cheese. I will make this again for sure. Thank you for the perseverance in perfecting the recipe. You’re more than welcome Isra! This cake is unlike any I’ve ever seen! So incredibly creative and delicious looking! It’s on my “to make” list! I have been dieing to make this recipe since I found it. Well I finally did last night and wow! It is as delicious as it looks. My blueberries were more mushy in the cake but when you tasted it you didn’t care. For your adding dry ingredients instructions I sifted th dry ingredients on top so they were already mixed. Definitely recomment this recipe. This will be a go to dessert. Thank you ?? This recipe looks delicious, it will be my first time baking a cake for my family so my question is, does the recipe call for unsalted or salted butter? Ladies stop stressing…do as I did. 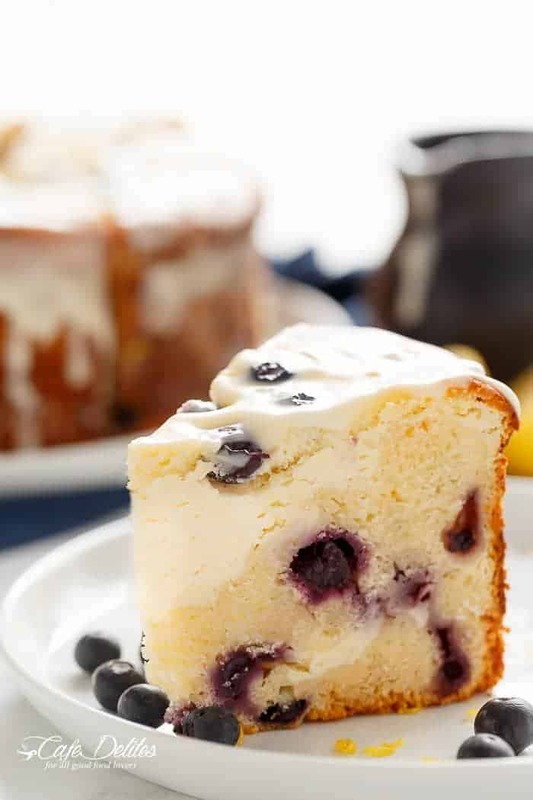 Use yellow cake mix using the lemon juice, milk, blueberries…etc. Follow directions for cheesecake batter and proceed with making cake. Never been good at baking cakes from scratch. Honey I solved that problem quick….needed that cheesecake in my life!!! i made this cake twice and both times it sunk in the middle after it was refrigerated.don’t know why….the cake was really delicious though! Has anyone had success with making this using gluten-free flour or a gluten-free flour blend substitution? If so, what flour or blend did you use and were any other adjustments needed? Would love to make this cake. Thanks. Hi Sharon, I believe they did but I can’t guarantee the outcome for you. Hopefully one of our readers can fill you in on measurements and brands! Hey, I am from Germany and I want to bake these beautiful cake, but I dont know how big one “cup” is, that you take. Can you maybe tell me how many gramms I have to take instead of one cup ? Amazing. I have checked this kind of recipe on the web.Finally found this great one.Hope to try this on sunday. I made this and it did not rise as much as it should have. Could it be I did not beat the batter long enough? I read the previous post of someone’s that did not rise. I am taking it to a party today, and hope it tastes ok. I am sure I put in the baking powder and mixed the dry ingredients together before adding to the wet. We’ve just eaten this and it is absolutely incredible! This must be the most popular and successful cake I’ve made in years. Thanks so much for the recipe!! Hey Karina! I am really interested in developing a red velvet cheesecake cake recipe that involves swirling the two batters like you did here. Do you have any pointers or recommendations? Thank you! Hi! I’ve made this recipe twice, and both times, it was amazing. I am really interested in developing a red velvet cheesecake cake recipe that involves swirling the two batters like you did here. Do you have any pointers or recommendations? Thank you! I have to say this was absolutely delicious! I served it yesterday for Easter and it was a hit! Will definitely be making again for other get-togethers. This sounds delicious; I think I’m going to make it for Easter. Can I use regular cream cheese instead of light cream cheese for the cheesecake? I’m not looking for a diet dessert, lol. Hi! I want to make this for Easter and was wondering if a different type of pan can be used as I don’t have a springform pan. Perhaps a bundt pan?? Cake was delicious. Thought I followed it exactly. The cake layers were dense and did not rise. Any ideas as to why? Just took this beauty out of the ove a while ago. Waiting to put in fridge. My question is, you say it has to be in fridge for 6 hours. I am planning on putting it in the fridge by 3:30 and I want to serve it at 8:00, only 4 1/2 hours. Will that work? This looks amazing! Can you use vanilla greek yogurt instead of the plain? Only reason I ask is that the plain is only sold in very large containers here, while I can get a small vanilla. I used frozen blueberries and it turned out perfectly fine. Only exception is that you’ll want fresh ones for the top as frozen ones look a bit shrivelled as they thaw. Run frozen blueberries under cold water until water runs clear. Dry well with paper towels and add them to the batter per directions. Turned out great! can I use frozen blueberry instead? Hi Jaynie! I don’t recommend frozen blueberries as they can alter the cake texture, but you can try it and see how you go? This looks amazing! I’m planning to make it for my mom’s birthday 🙂 just one quick question: would I be able to substitute the flour with spelt flour in the cake part? Should I do half spelt and half normal plain flour? Thank you for the wonderful recipe! Wow Cheree 15! Those are some lucky hunters! When you said powdered sugar.. You mentioned a stevia been that you use… Do you use Truvia? Is it the same measurements regardless? In another recipe you mention sour cream or Greek yogurt … Do you have a preference for best taste? No I haven’t Glennette! I’m so hoping it works out! Good luck! Please let me know how you go! This cake is beyond divine;, I know exactly what you mean about that soul-crushing sense of hopelessness when cake after cake lets you down (yes, I blame it on the batter, not my mistaking of proportions). But finally a phoenix of a cake rises, golden brown, triumphantly fragrant and sinfully moist. You’ve combined just about all my favourite flavours. And, carrot cake is something that sends me into paroxysms of delight but then you’ve swirled cream cheese through it (which is too much)!! I adore cheesecake but have never made one because they seem so intimidating. Sneaking in layers of cream cheese into cake batter sounds like the most delicious sort of cheating. Can’t wait to try this out. It should be fine but I haven’t tried this recipe with soy milk. I’ve been looking for a blueberry cake that’s not just the same old, blueberry-lemon layer cake and THIS looks PERFECT! I love cake AND cheesecake! I’m actually planning on making this for my own birthday on Saturday (it’s a little thing I like to do). When I was trying to decide on what type of cake to make, I asked my 3 year old for suggestions and she exuberantly shouted, “blueberry!” I think this’ll be a big hit! I’ve made this cake twice. The first time, I made a mistake and used too large of a pan, so I wound up baking it too much. I made this again for a Memorial Day dinner making sure I used the right size pan. It was absolutely delicious and everyone loved it. The glaze over the top adds a nice tartness . Will make this again soon. Just made this cake today And had it For dessert. It is (as all of Your recipes) amazing! I used splenda For the entire recipe And had it in the oven For 60 minutes. It turned out great but next time I will take it out of the oven after 50-55 minutes. I hope it wil be even more moist. Maybe Nice to mention in Your recipes when choosing for a sugar substitute such as sucralose, splenda the recipe will need 5-10 minutes less baking time. I have a 9-inch springform pan. If I 1.5x the recipe, do you think it will work or should I increase the recipe by 25%? thanks. This looks amazing! Do you think you could make mini cakes in a cupalcake pan with paper liners?? I’m thinking about a birthday party with kiddos! Yes absolutely Simone!! That sounds adorable and would be a huge hit with kids! Should the first layer of cream cheese be spread on as a “layer” or put on the batter randomly ? Realized the reason my cake was too done was that I used the wrong size pan. Oops! Well, another lesson learned! I’ve been wanting to make this cake and found time to make it today. My oven runs a little hot, so wound up baking the cake too long. ( Lesson learned). It still looks delicious. It’s cooling the the refrigerator now. Can’t wait to have some. Will make it again for Memorial Day with proper baking time.? This was the best damn cake I ever made! When I saw it on Facebook I was scared to make it. It looks complicated but it’s so easy. Your detailed instructions helped me heaps! I’m making it again right now lol! My cake is only 1 1/2 inches high.Is that how high it’s supposed to be? It’s good to know that other people have bad cooking days and bad shopping days! Here I thought I was alone! Haha no definitely not alone! Hi! I made this for my mom today and she LOVED IT! I couldn’t wait to thank you times a million!. She’s been having a hard time lately with losing my dad to cancer, and today was really important to us for her. Your cake was definitely the cherry on top! It was fluffy and tasted so good. I used sour cream instead of the greek yoghurt because I didn’t have any, and it still turned out. Thank you Karina! I don’t know if you’re aware but your recipes do make a difference to someone’s day! I hope you had a great Mother’s Day! You deserve it! Hey, I just tried this cake today! The flavor is great, but for some reason my batter for the cake part turned doughy/dense. D: I folded the flour in…What did I do wrong! I’m not sure Seo! Did you add the baking powder? 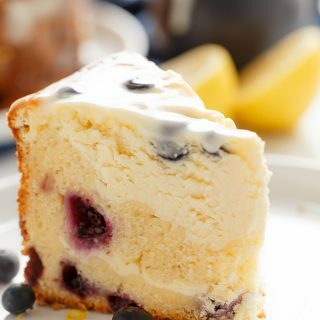 I just joined your site and want to make the Lemon – Blueberry Cheesecake. It looks lovely! The sugar that goes into the Cream Cheese Glaze – is it powdered sugar? Please respond to my email address – [email protected] if you can, instead of just on your recipe page. I read your amazing story and wish you continued good health. Hi Linda! Yes it’s powdered sugar! Hi just wanted to know if raspberries could be substituted for the blueberries? Hi Irma! Yes that would be great! Hi I love your story and determination. I wanted to know if I could substitute raspberries instead of blueberries? Do you think it’d work? Just to clarify, for the cheesecake batter, you list powdered sweetener or sugar. This means sugar, not powdered sugar, correct? So excited to try this it looks delish! When you listed natural powdered sweetener or sugar, did you mean powdered sugar or regular sugar? Do you need to store the cake in the fridge or can it sit on the counter? Mine is in the fridge now cooling. Looks great. So glad I found this recipe. I have made the cake and it’s currently in the fridge. I haven’t tried the finished product yet, but the batters tasted AMAZING! I made it to celebrate a birthday this evening and I was just wondering if you would advise glazing it in advance or right before serving or if it doesn’t matter. Thanks. Hi Alison! I hope you all like it! It doesn’t really matter when the glaze goes on, but if you’d like it to be fresh and glossy, I recommend pouring it on just before serving 🙂 Happy Birthday to the birthday person! I just have a quick question can you use frozen blueberries instead of fresh and also can you substitute sour cream then Greek yogurt? Hi Cindy! Yes you can use frozen blueberries and sub sour cream. Perfect substitutions! Interesting combination of flavours. Great this has given me some inspiration for a dessert i will try this weekend. Made this today and it was fantastic. The only issue I had was the frosting part was very thick and white not like the picture at all.1-2 tablespoons was definitely not enough to thin it out. Is there something I’m missing. Other then that everyone loved it! I’ve been wanting to bake this cake for weeks after seeing it on pinterest & now an occasion has finally come up & I could do it ☺️?? It’s currently in the oven, don’t know the result yet but the smell is divine!!! Can’t wait for it to be ready ?? Oh my gosh Sherona how did it turn out with the strawberries?! I know strawberries release moisture in baking, more than blueberries, so I’d love to know if it turned out! It’s baking as of now, my mom & bfs Birthday’s for friday.. lemon is that happy place for me!!!! Hi Cheryl! Happy birthday to them both! Wow you have a busy weekend ahead! Lemon IS a happy place. I couldn’t agree more. I hope they all approve of this cake! Do you think this would bake up the same if I omitted the blueberries and just wanted lemon cheesecake cake? I’m assuming it would, but sometimes you never really know. Hi Becky. That should be fine and YUMMM! I think I’ll be trying that too now! 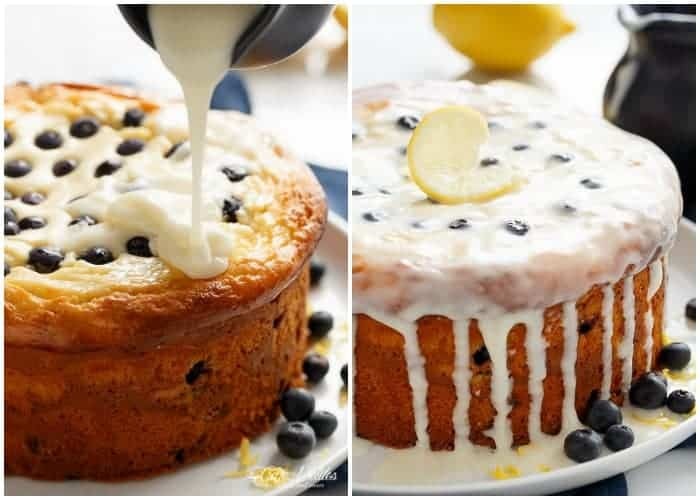 Love blueberries and lemon together and the combination of cheesecake and cake together with the glaze have me so ready to make this cake! When making the cheesecake would I substitute powdered sugar or granulated sugar for the natural powdered sweetener? Your photos are gorgeous. Thanks! This sounds amazing. Do you know how manWeight Watcher Smart Points? Hi Regina. No I’m sorry I haven’t worked them out. Do you have a recipe builder? Karina when you say 11/2 cup of plain flour, will that be US cup or Aust metric cup? Thank you. Wow, this looks really good! I’ve been thinking about combining blueberries and lemons lately, but I do have a couple of questions. Can I substitute something else for the blueberries using the recipe as is, or would I just have to play around with it on my own? Also, I don’t like Greek yogurt, like, at all…so could I substitute something else or just leave it out entirely? Thanks! Hi Brandi! Yes you can definitely sub out the blueberries for another type of berry. And the Greek yogurt can be replaced with sour cream! I hope you like this cake. It’s to die for! This looks SOOO GOOOD ♥ But what did you mean by, mixing them first on top of the wet ingredients? Hi Adrienne! Usually, dry ingredients are mixed in a separate bowl to combine them first before adding into the wet ingredients. But, by doing it the way I’ve written out in the recipe, we save a bowl by adding the dry ingredients directly on top of the wet ingredients, mixing only the dry ingredients together first BEFORE mixing them through the wet ingredients. Does that make sense? Wow this looks delicious! Lemon and blueberries are my favourite. Damn, you went through hell to achieve this cake perfection! Im glad you didn’t give up, because it looks and probably tastes like heaven! Me too Bethany! I had cake for days lol! Oh my! What bad luck you had with this cake….looks totally worth it! Lemon, blueberries, cheesecake = YUMMY! Pinned. Thanks for sharing.